Posted on February 22, 2017 at 4:54 pm. Pubs and clubs around New South Wales may be subject to a new bill regarding the transparency of gambling related data. If approved, the bill will require all gambling venues to publicly publish figures showing the amount of money lost to the pokies each month. Victoria is already subject to such regulations, with gambling statistics published by the states regulator twice a year. 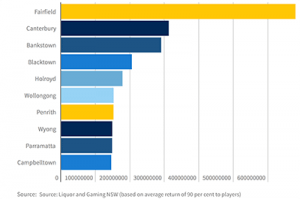 Calls for the transparency regulations came after figures obtained by Liquor and Gaming NSW revealed $5.4 billion was lost on the pokies in clubs around NSW in the 15-16 financial year. Overall, $80 billion was spent on the pokies in the state, marking a five billion dollar increase in pokies expenditure from the previous financial year. The data revealed the Fairfield local government area as the biggest pokies hot spot, with $681,219,755 lost to the machines last financial year. These are concerning figures given that Fairfield has been labelled by the Australian Bureau of Statistics (ABS) as New South Wales most disadvantaged community. The average pokies loss per resident in Fairfield is $4,171 per year – more than 10% of the average annual income for the region. Greens MLC Justin Field purchased the data from Liquor and Gaming NSW as part of his “People Against Pokies” campaign. While the annual spend on the pokies is released once per year along with a record of the number of machines per council area, the gaming turnover per venue is not currently recorded or publicly reported. Mr Field has expressed a commitment to publishing the data each month and has drafted a bill that would require all NSW pubs and clubs to reveal how much is gambled at each venue and the profits earned from gambling. If approved, the bill would require monthly publication of the pokies losses in all NSW clubs and pubs. Mr Toole said the call for publication of the data is nothing more than the Greens crusade to shut down local clubs and pubs. He said he is only interested in helping people who have a problem with gambling. By now it is public knowledge that the amount of money lost to the pokies is astounding – this is not information that’s kept under wraps. Figures are constantly being released that reveal pokies expenditure, revenue and losses around the country. If club owners and governments are serious about wanting to support responsible gambling practices, vendors being legally required to reveal how much they earn from pokies losses shouldn’t be that big of a deal. This won’t stop punters from gambling at their venues, but could help raise awareness of the reality that lower income areas are more prone to the impacts of problem gambling.